Budd's Subaru | Blog | X-Mode – What is it? How does it work? X-Mode – What is it? How does it work? is the Have you ever had to start your car on an icy slope and ended up dangerously close to getting stuck? 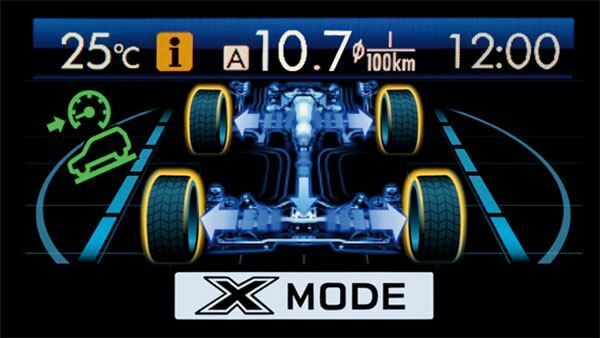 Try X-Mode (CVT Transmission only). X-Mode isn’t available on all cars, only the new Forester. It sure helps tackle intense terrain like mud, steep descents, and anywhere that you might have less grip and control, or all four wheels are not on the regular road. At the press of a button, the vehicle becomes in-control during conditions that are difficult for an ordinary driver to evade. Turning X-mode on during hill descent means the system automatically applies the brakes to each wheel at a controlled speed, making your descent even and smooth. It maintains the speed that you set so you can concentrate on steering. You don’t have to worry about stepping on the brakes in error, causing a slide. Descents on X-Mode are smooth, giving you the confidence to continue your journey. The Hill Holder System makes sure that when you are on a steep incline you can accomplish it safely and confidently. You will be free from all concerns of rolling backwards or stalling the engine. It controls the AWD system and keeps you in one place when no gas is applied. This prevents you from sliding back into a position where there is no grip, allowing you to safely get up the hill. How did they determine that this tool would get you out of a sticky situation quickly? Subaru conducted repeated tests on all sorts of terrain. They tailored the system to create safe driving conditions out of the wildest road. Simply turn the system on and it takes control of your engine, transmission, AWD system, and brakes. During the testing faze, steep, unpaved inclines were used with icy patches. Slippery mud, or bumpy terrain where not all four wheels were on the ground was also used. Testing also took place on silver rollers, manufactured terrain with a surface that doesn’t change over repeated use. The Subaru Forester X-Mode would help maintain safe and secure completion over both. Nature made or man-made, the X-Mode and Hill Hold features in the Forester helps combat it all! Click here to learn more about the Forester.